An eminent British business leader, he headed IBM's operations in the UK for an astonishing 25-year span from the 1960s to the 1990s where he championed new business methods. He was one of the most powerful influences in shaping British industry's response to the technological revolution. Besides building up IBM's own manufacturing activities to the point where the company employed more than 15,000 people in Britain, with UK turnover increasing from £45m to £1.6bn, he was a tireless advocate of management education, with results to be seen in a clutch of academic institutions. He succeeded by paying careful attention to staff views, with the company's own Speak Up program, and by leading from the front in encouraging them to engage in the community and business associations. IBM's own culture put a high priority on management training and he was one of the leading businessmen in trying to get British companies to take it seriously. For a decade he was a member of the Foundation for Management Education, he chaired the council of the Manchester Business School and he was a council member of the Oxford Centre for Management Studies (now Templeton College). It is said that, “his most telling achievement was to operate the subsidiary of one of the world's most rigid companies…IBM in a manner that encouraged UK staff and enabled IBM to be appreciated as a key part of the British industrial scene.” - Martin Adeney, “Sir Edwin Nixon: IBM chief executive, he championed new business methods”, The Guardian (UK), September 17, 2008. He was born in Leicester, England and was educated at Alderman Newton’s School, Leicester and went on to read Mathematics at Selwyn College, Cambridge. In 1950 he joined UK-based, Dexion as a management accountant. The company manufactured patented storage systems. In 1952 he married, and in 1955 he was recruited by IBM where he was successively Managing Director, Chairman and Chief Executive. The company had established operations in Britain only four years earlier, with products such as punched card machines for data storage, which faced fierce competition in the UK. He became Managing Director within 10 years, at what was then regarded as the young age of 40. By then IBM was establishing itself as the leading manufacturer of huge mainframe computers. Its 370 series launched in 1970 was a world beater, and in 1981 it launched the first personal computer. From his headquarters on the South Bank by the Thames, close to the National Theatre, he encouraged his staff to be involved in the wider industry. IBM played an active part in the National Computer Centre and he chaired the CBI's committee on consumer and marketing affairs from 1971 to 1978. The reputation of IBM machines gave the company huge advantages, encapsulated in the popular business tag that "No one ever got fired for buying IBM." But he faced particular problems in the UK as successive governments attempted to build up an indigenous industry and engineered the creation of ICL as a national champion. He made his own contribution to British technology, encouraging the concept of Silicon Glen, with a cluster of computer businesses in Scotland echoing California's Silicon Valley and building a second IBM manufacturing complex at Havant in Hampshire, not far from his home in Petersfield. By the time he stepped down from IBM in 1990 other companies were marketing their own PCs and IBM was struggling to adapt from a business with a relatively few large customers to one which also sold millions of small machines through dealers. But as his successor, Sir Anthony Cleaver, puts it: "To lead an organisation for 20 years through a period of unparalleled change, to see how to handle these huge technological changes and stay at the head of the company was an outstanding achievement." His strategic skills were recognized by appointment in 1988 as Chairman of Amersham International, the former medical diagnostics arm of the Atomic Energy Authority, recently the Thatcher government's first privatisation. He was credited with introducing a more commercial outlook and encouraging executive talent, notably with the appointment of Bill (now Sir William) Castell as Chief Executive. He was appointed CBE (Order of the British Empire) in 1974, and knighted in 1984. In 1987 he became a Deputy Lieutenant for Hampshire. He was a Director of Royal Insurance and Deputy Chairman of NatWest from 1987 until 1996. 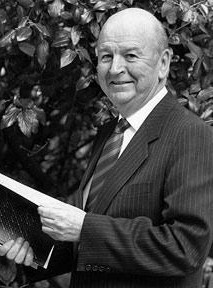 His extensive educational activity included serving as Pro-Chancellor and Chairman of the Council of Leicester University and as President of the National Association for Gifted Children. After the death of his wife, Joan in 1995, he married Bridget Rogers in 1997. He died at age 83 in August of 2008 and is survived by his wife Bridget and a son and daughter from his first marriage.